While working up a post (that should be published tomorrow) about The Legend of Zelda: Skyward Sword, I came across the art that seemingly will grace the covers of the standard and limited editions of this much-anticipated Wii game. Well, you know what that means: Another round of "Which Box Art is Better?" Which one do I prefer? Well, I usually like Zelda games to have golden covers, but this time I'm casting my vote for Japan's shimmery, summery standard edition. Which piece of box art do all of you prefer and why? ... Okay this is one situation where I can't decide! Like you, "standard Zelda gold" just feels so RIGHT, and yet lately I'm digging these colorful Zelda covers! Like the Japanese OoT3DS cover, that was boss. I'm content with what we're getting in NA for once, so I suppose that's all that matters in the end. Y'know, I love the colors of the second one, but it makes Link look like he's in a gladiator fight with the two faces around him. There's a lot of gold on the first one, but I think it's a little more simple, so I personally go with the first one. Ah, well, at I'm not alone this time :) Like you, Kamiwoo, I like both covers. I certainly won't complain about the golden NA cover -- should I pick up the game (more on that later) -- but at this point I definitely "prefer" the colorful Japanese standard edition. Oh, I hear ya, Matthew. Combining the ideas would be cool, I think. That said, I'd probably still prefer the colorful version. The standard Japanese version has all that epic vertical depth and a great use of colour. So..
Yay! Someone else likes the standard Japanese version :) Really, I'm quickly falling it love with it, I think. I wonder if that will eventually be used in the US, too, or if we'll always have the golden version -- regardless of standard or limited edition? 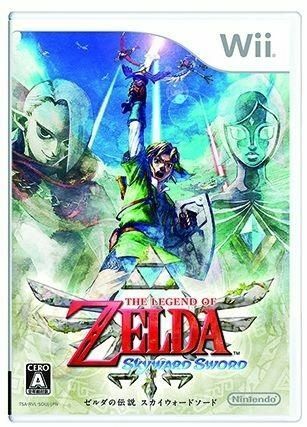 Are you a huge Zelda fan, Justin -- as in, you buy pretty much every Zelda game released --or are you interested in this one for other reasons? Just curious. Other than that, I like that gold controller, too! Argh, this fall/winter is going to kill me!! Ah, I thought you were a big Zelda fan, Justin, but I wasn't sure. I *used* to be a big fan, but my interest has waned a bit in recent years. (I'm going to publish a post about that very thing in just a few minutes, interestingly enough.) That said, I realllllly like the look of Skyward Sword. You don't like the colorful cover, Trxd? Why not? You're free to your opinion of course -- I'm just curious, especially since you seem to absolutely hate it! I actually really love that color scheme, but on that cover it just looks way too pastely and rough, as if it was colored in using crayons. I think it looks horrendous, but if the color was more solid I would probably love it. It should be noted that I love the pastel effect on Link himself, and I think the gold in the background of the first cover evens that out, but the second cover... just looks like someone spewed. Ugh, that sounds horrible! You liked Spirit Tracks, though? I can't decide. The Japanese box art has more going for it. 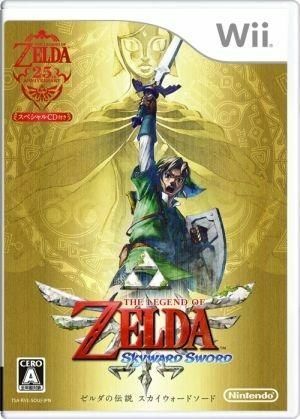 But the gold box art is classic Zelda. And from a marketing stand point, it would stand out more on a the shelf of a video games retailer.